Chagrin Highlands is an extraordinary 630-acre corporate community located in east suburban Cleveland, Ohio, directly on the heavily traveled I-271 corridor. With Eaton Corporation’s Eaton Center campus, University Hospitals Ahuja Medical Center and Life Time Fitness, Chagrin Highlands is well positioned to support a broad variety of retail, dining, hospitality and convenience businesses. 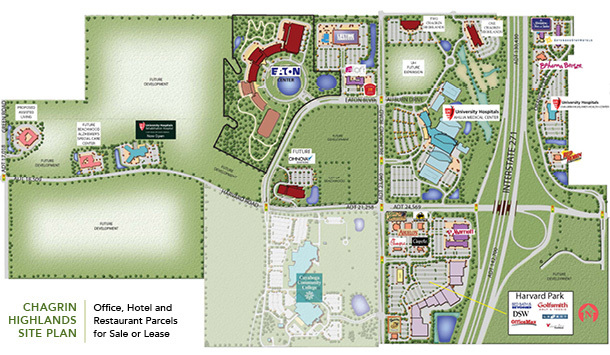 The development also boasts of two world class office buildings: One Chagrin Highlands and Two Chagrin Highlands. Upon completion, Chagrin Highlands will offer roughly 3.5 million square feet of distinctive office space spread among a carefully crafted selection of single corporate user, multi-tenant and research/development building facilities. Chagrin Highlands will also offer up to 250,000 square feet of support retail and approximately 1,000 on-site hotel rooms. Chagrin Highlands Ltd. is a joint development of affiliates of The Richard E. Jacobs Group, Inc. and Scott Technologies, Inc. Within minutes of Chagrin Highlands are the affluent and educated consumers that retailers and restaurants crave. Nearly 200,000 people live and work within a five-mile radius. They hail from some of the region’s most distinctive and sought-after residential areas. For them, Chagrin Highlands is a key destination for shopping, dining and conducting business.